The sustainable building movement will reach new heights in 2017 as new high-performance commercial towers continue to join the growing crop of green buildings popping up around the country. The Green Building Council Australia (GBCA) announced at the end of 2016 that it had certified 80 per cent more Green Star buildings in 2016, a large chunk of which came from commercial projects which now totals over 520. Changes to the federal government’s Commercial Building Disclosure (CBD) Program will also come into effect in July this year, lowering the mandatory disclosure threshold on commercial office buildings from 2,000sqm to 1,000sqm. The reduction will see the NABERS energy performance of more commercial buildings displayed at the point of sale, giving those with a smaller energy footprint a competitive edge in the market. These advances generally reflect the growing awareness from all spheres of influence about the carbon footprint of the built environment, which the GBCA says accounts for around 30 per cent of the world’s emissions. Most of the bigger ratings systems, be they from the private or government sector, are generally aimed at reducing this statistic and therefore take a holistic and easy-to-calculate approach to assessing a building’s environmental performance for maximum impact. The GBCA for example dedicates 24 of a possible 110 credits in its Green Star - Performance v1.1 assessment tool to a building’s Greenhouse Gas Emissions and Peak Electricity Demand, but it doesn’t certify, prescribe or promote individual products or systems. While this helps Green Star remain current and up-to-date, it also places onus on the designer to do their research when it comes to specifying building systems and materials that impact these performance metrics. One such system is vertical transportation or lifts. So how do we exactly do that? Lifts have come a long way since the first passenger lift was installed by Elisha Otis at New York’s Haughwout Building some 160 years ago. Today, specifiers have access to a diverse range of energy efficient lift options which incorporate functions like regenerative drives, machine-room-less (MRL) technology, standby mode, destination dispatch, and energy efficient lighting. Of these upgrades, regenerative drive technology is perhaps the most significant. Regenerative drives capture the electrical energy (heat) otherwise lost by a motor operating at a higher capacity than necessary and then feeds it back into the building’s grid. In the lift world, this occurs when the weight of a lift travelling upwards is less than its counterweight, or when a lift travelling downwards has an overly heavy load. When a motor is in reverse rotation (as in the examples above) a regenerative drive takes the electrical energy generated by the motor and feeds it back into the grid, thereby reducing energy consumption of lifts (by up to 70 per cent in some cases) and also the use of HVAC systems by minimising excess heat. MRL lifts have also proven to be a big saver on energy and emissions for buildings. They use permanent magnet motors and gearless traction machines, which can reportedly save up to 50 to 80 per cent of energy compared to traditional hydraulic and geared traction elevators. They allow for a lift’s machinery to sit in the shaft itself, rather than in a machine room which would consume more space. Vanguard, a MRL lift, from Orbitz Elevators delivers major savings in energy consumption with its gearless motor that requires no lubrication or oil. Furthermore, a regenerative drive can be incorporated and reportedly saves up to as much as 50 per cent of the lift system’s total power consumption. A reduction in lift machine size has also been a big improvement for lift technology, according to Steve Newton, national transit management and top range manager at Schindler Australia. Schindler’s 5500 series for example uses about 30 per cent less energy than comparable lifts thanks in part to its reduced machine size, which is also around 30 per cent smaller than traditional machines for the same speed and load. “Smaller machines and less friction– it’s all about using less energy,” says Newton. The Schindler 5500 also features high-efficiency regenerative drives, traction media belts instead of ropes, a gearless machine, LED lighting, and a standby function. A total of 23 Schindler 5500 and its bigger brother S7500 were specified for the recently completed Victorian Comprehensive Cancer Centre (VCCC) in Melbourne, designed by a consortium of architects including Silver Thomas Hanley, Designinc and McBride Charles Ryan. The project also incorporated a destination dispatch system which directs passengers to the lift that will get them to their destination in the shortest travel time. The idea is that by grouping people together based on the floor they are traveling to, lift traffic is improved and less energy is used. These features combined earned the VCCC project the title of 2017 Elevator World Project of the Year from the International Building Transportation Industry. Finland-born lift company, Kone also has a suite of products with reduced machine sizes, energy regeneration options, standby modes and a vector-controlled drive system which efficiently manages motor current and torque. Its Highrise Minispace for example requires 40 per cent of the space a conventional traction elevator machine room demands, and together with the other features we just mentioned, significantly minimises both mechanical and electrical losses. Standby modes appear to be a common feature among most lift suppliers, and as the name suggests, basically means a light’s lights and fans will automatically turn off when the lift is not in use. ThyssenKrupp also offers a standby function for its ‘Twin’ system, but Twin’s major feature is its unique two car mechanism. Two cars are arranged on top of each other and operate independently on one hoist way. Unlike a double-deck lift system (which consists of two cabins attached together – one for odd floors, one for even), Twin can park one car while the other stays in operation. This means when passenger volumes are low, no energy is consumed by moving empty cars. Additionally, the systems can be equipped with an energy recovery function that can feed about 30 per cent of the energy generated by braking back into the building’s power grid. Similarly, Fuji Elevators Australia’s gearless traction machines can save more than 46 per cent of the energy of a traditional lift. 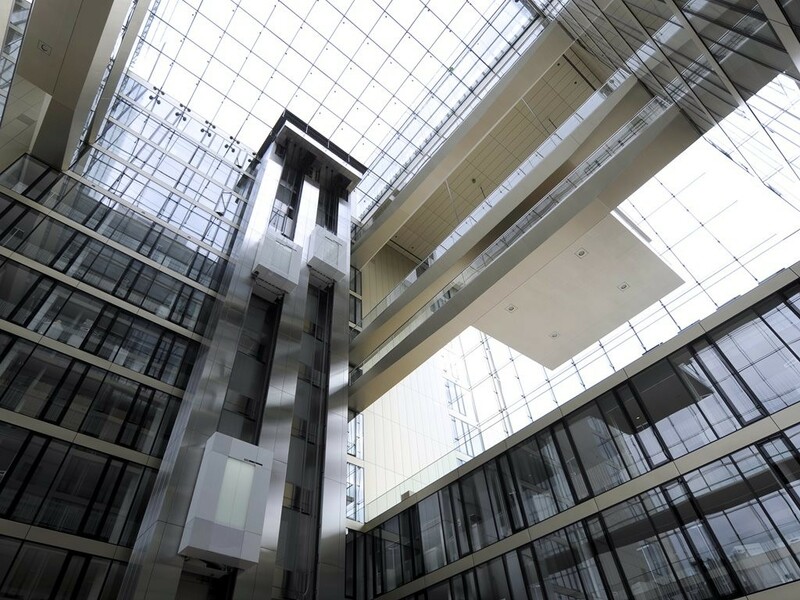 Specifying a sustainable lift does go beyond just its energy consumption and emissions. It should also involve consideration of materials used, which includes things like interior paints, flooring, control panels, lighting, and HVAC systems. Under the Green Star rating criteria this could fall under the categories/credits of Indoor Environment Quality and Materials. For example, unhealthy air quality in a lift can be prevented with low-VOC materials (whether this be walls, flooring, sealants or adhesives), reducing health and safety risks. This can also be done with low toxin lubricants – by implementing a MRL lift it prevents the need for toxic lubricant oils.